What do erupting volcanoes, learning to code, building bridges, creating art, and cooking have in common? They are all STEAM activities! This past year I started working as an external evaluator on Lincoln County School District’s (LCSD) 21st Century After School Program. There are seven sites throughout the county that are funded as 21st Century Community Learning Centers. The goal of the federal program is to “provide academic enrichment opportunities during non-school hours for children…offer students a broad array of enrichment activities that can complement their regular academic programs, and offer literacy and other educational services to the families of participating children.” LCSD’s program aligns with these goals, focusing specifically on providing students and their families STEAM-based activities. Being a new project in the 2013-2014 school year, the 21st Century After School Program kept me on my toes as an external evaluator. All documents for data collection had to be written very quickly so they could be distributed as close to the start of the school year as possible. While the tools for collecting data did not fail they certainly could have been better. As the program moves into the second of it’s five years, I thought it best not only to redesigned some of the tools but also to communicate to the site coordinators why collecting this data is important. Site coordinators, one for each of the seven sites, are responsible for distributing, collecting, and turning in all of the instruments I use to collect data. The only part of data collection they are not responsible for are the standardized test scores, which are handled by the school district. Collecting data is no small task for the site coordinators because they already have a lot on their plate. Therefore, the program coordinator and I agreed that sharing results from the first year would showcase the importance of data collection. Early in September I presented preliminary findings at the first site coordinator meeting of the second year of the program. You can view and listen to my presentation here. The presentation ends with me addressing the four main instruments for data collection: a monthly recording sheet to document the STEAM activities and resources, the student STEM interest survey, a family literacy and STEAM night reporting document, and the parent survey. Working as an external evaluator on these types of projects is always exciting for me. They push me to think in new ways and certainly make me a better researcher and evaluator. If you have any questions about the 21st Century After School Program or the documents I’ve produced, please feel free to be in touch. Posted in Evaluation, Methodologies, Partnerships. 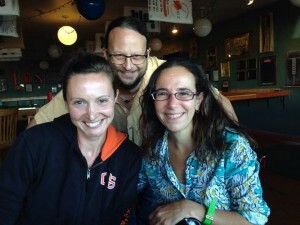 Luisa Massarani is our guest blogger today. She was one of our cyberscholars, visiting Hatfield and Cyberlab from June 29th through July 4th, to learn our tools and resources in order to collaborate with us from the Brazilian Institution she works for, the Museum of Life (Museu da Vida), FIOCRUZ Foundation. Luisa is also the director of RedPOP-Unesco, the Network for Popularizing Science and Technology for Latin America and the Caribbean. Over the last decade, Brazil has been systematically investing in public engagement in science and technology (S&T), both in pratical activity and in research. As someone who works in the field, I don’t need to be persuaded how much it is important to invest in it. In fact, other countries around the globe have been much more aware of the importance of supporting public engagement in S&T. However, less effort has been put into understading the meaning different publics make of the public engagement in S&T actitivies – a challenge faced not only in Brazil but also around the globe. In my view, understanding the audiences is, in fact, the main question mark we face in science communication. This was the main motivation that made our research group at the Museum of Life – a hands on science center in Rio de Janeiro, linked to the research institution Oswaldo Cruz Foundation – focus our attention to audience studies. Latin America has good scientific production in audience studies – mainly in soap operas. Very little, however, has been produced in science communication. In 2009, we succeed in having a grant for designing a study on audiences and science coverage in TV news as result of a collaboration among 10 countries in “Ibero America” (Latin America plus Portugal and Spain). Since then, we began applying the methodologies we used for that study in the context of a science exhibition. In particular, we were very excited to understand further science exhibitions and 5-8 years old kids – which is a wonderful age for engagement in science due to their natural curiosity about the world around them. Furthermore, there is a substantial gap of literature focusing on this issue. We feel that further methodologies are necessary for understanding in fact the meaning the kids make of the exhibitions.Thus, since the very begining, the connection with Cyberlab has been very exciting, due to the opportunity for opening new intellectual doors for us. Visiting Cyberlab in person during the week of June 30th was not only very useful and important from the point of view of developing new and more robust methodologies but extremely inspiring for new research and collaboration ideas. I go back home prepared to start phase 1 of collecting data of the exhibition entitled Forest of Senses, which aims to foster curiosity of kids toward the Brazilian biodiversity. We will implement the methodology we designed together with the Cyberlab team, including installing the equipment that will allow us to transmit to Newport in real time what we will be observing in Brazil. We hope to, very soon, have results to share with all of you! 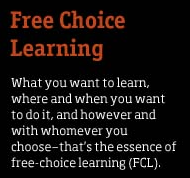 Posted in Free-Choice Learning, International, Learning Tools, Partnerships, Science Communication. As the school year comes to an end so too do the school-based projects I evaluate. What this means, first and foremost, is a mad rush to collect data. It’s also a time for those involved in the project to come together and share what they’ve been doing for the past 8 months. As an evaluator, I have been focused on the mad rush of data collection – writing surveys, distributing surveys, leading focus groups, and conducting site observations. All of this data is needed to prove these projects are doing great things; however, what I truly love is hearing about the activities educators are using to engage their students in STE(A)M.
As an evaluator I have to ask: how do you capture the amazing ideas these educators are coming up with and how do you evaluate the impact they’re having? And by impact I mean both the impact on students and the impact on other educators who are hearing what’s been done in other educational settings. What I’m actually asking is how do you evaluate jaw-dropping moments? To put these questions into some context I need to clarify that I am, from here on, talking about my experience as one of the evaluators with the Oregon Coast Regional STEM Education Center . The STEM Center is a collaboration between Lincoln County School District, Tillamook County School District, and countless institutions and organizations up and down the Oregon Coast. A U.S. Department of Education Math Science Partnership grant funds the STEM Center, which offers professional development to teachers in both school districts. Over the course of the school year the teachers put Project-Based Learning (PBL) into practice. Now to turn back to the questions I asked above. How do you capture the amazing ideas these educators are coming up with? We do collect and archive as much as we can, specifically PBL overviews, PowerPoints, assessments, and other resources teachers and students use during PBL and include them all on the website for others to use. 2013-2014 school year PBLs should be up this summer but you can peruse 2012-2013 PBLs here. 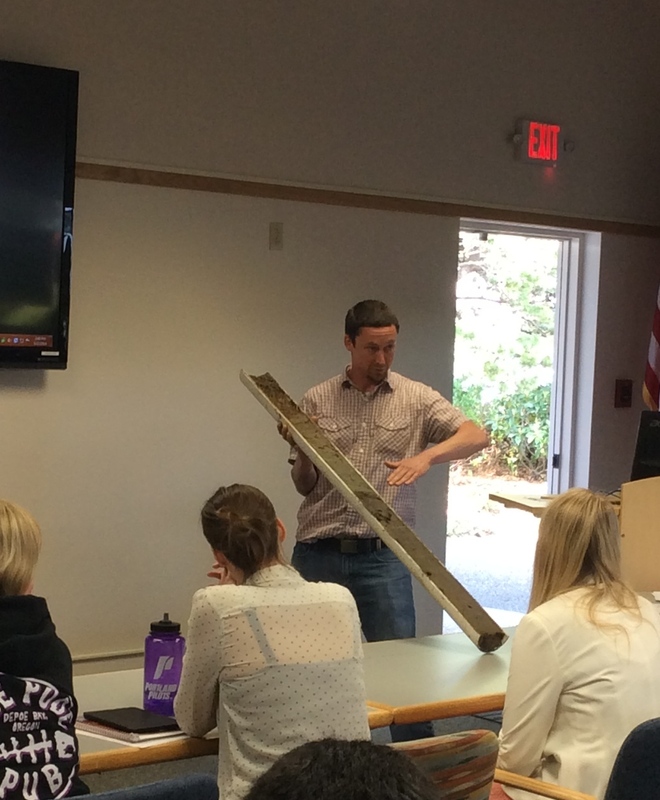 Sean Bedell shows his colleagues a core sample he and his students took while looking for evidence of Oregon’s 1700 tsunami (project further discussed below). How do you evaluate the impact these projects have? This question is more difficult to answer. For students, we distribute a STEM interest survey at the beginning and end of the school year and we use student test scores, but to me that can’t tell the whole story. The hard pill to swallow as an evaluator is that in order to capture what I would call the true impact on students and the whole story, this project would require longitudinal study (think 5 or 10+ years of collecting data and interviewing students). We also have teachers complete pre- and post-project surveys and have them write a reflection and those sources have proven to be useful in past projects to understand impact. We talked about running a focus group with the 2013-2014 STEM Center teachers to gauge how they incorporate all of the information delivered through professional development to plan and implement their PBLs. Anecdotal evidence shows that teachers are no longer taking a kit or pre-written lessons and using it as is in the classroom; instead, they are taking ideas from multiple sources and piecing together large scale projects. Essentially, their self-efficacy to do PBL and STE(A)M in the classroom is rising. – Students at Newport Prep Academy studied marbled murrelets and corvids, specifically how the latter prey on the former’s eggs. Human interference (i.e. leaving trash at picnic sites) brings corvids closer to marbled murrelets. Check out the Public Service Announcements produced by the students using iPads and iMovie. QR codes the students created will soon be at picnic areas of state and national parks. – Students at Eddyville Charter School focused on tsunamis. They designed, built, and tested their own tsunami structure at Hinsdale Wave Research Lab. Students also researched the earthquake and tsunami that hit Oregon in 1700 by taking core samples at five different locations to look for tsunami evidence. Check out their website, which contains videos and student wikis about the project. 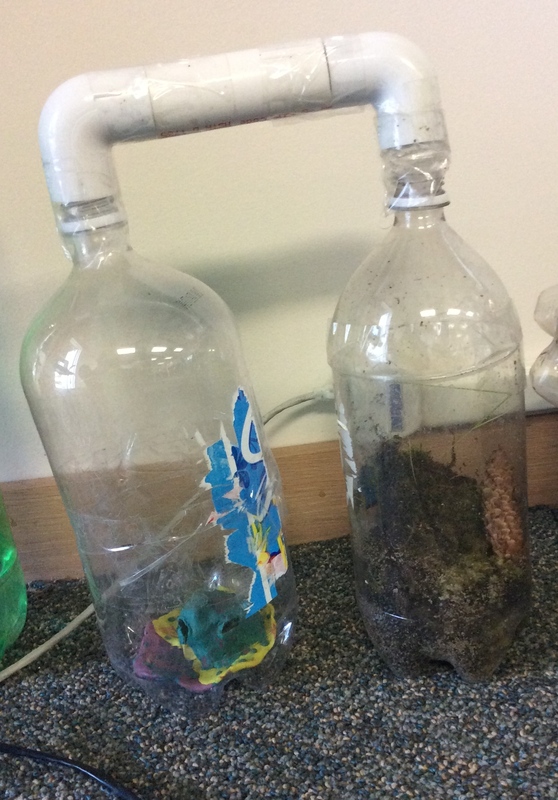 – At another school, students had to engineer a closed forest ecosystem to gain an understanding on how we could sustain life on another planet. 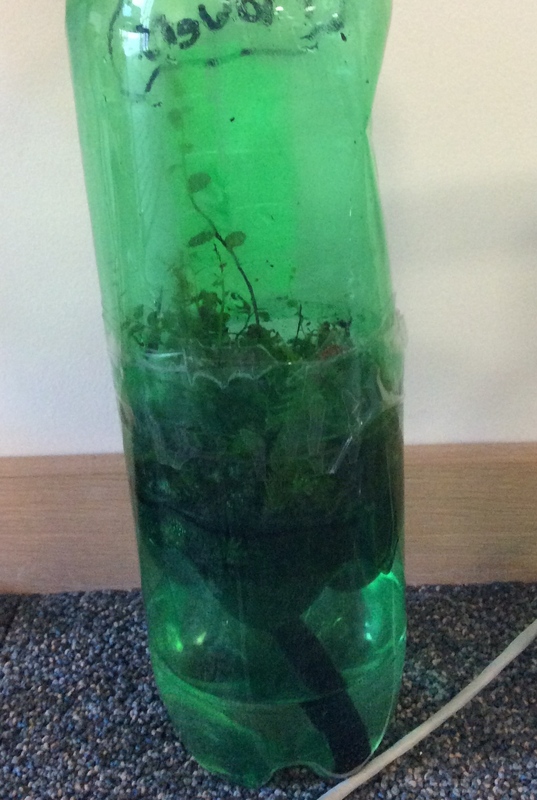 This was definitely a test-retest project as students had to monitor pH and water levels to keep plants alive. Many students had to re-engineer their plans and use different materials to meet the challenge. 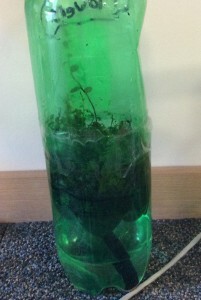 Examples of student-designed forest ecosystems. – In Tillamook, elementary students were given a challenge by the local utility company, which was really a fake letter written by the teacher with the company’s approval. 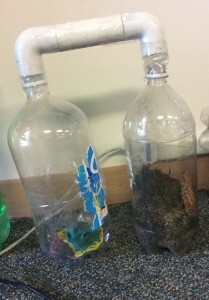 Students had to evaluate different sources of renewable energy and where such sources could be placed within the landscape to be most efficient. At the end of the PBL, students presented their findings to an expert panel. See? Jaw on the ground! And this is just a sample of what these amazing teachers in Lincoln and Tillamook County School Districts are working on with their students! 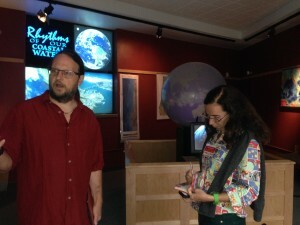 Posted in Environmental Education, Evaluation, Methodologies, Partnerships. It is not always about numbers! The challenges of integrating the natural and social sciences are not news to us. After King, Keohane and Verba’s (KKV’s) book entitled “Designing Social Inquiry”, the field of qualitative methodology has achieved considerable attention and development. Their work generated great discussions about qualitative studies, as well as criticism, and sometimes misguided ideas that qualitative research is benefited by quantitative approaches but not the other way around. Since then, discussions in the literature debate the contrasts between observations of qualitative vs. quantitative studies, regression approaches vs. theoretical work, and the new approaches to mixed-methods design. Nevertheless, there are still many research frontiers for qualitative researchers to cross and significant resistance from existing conservative views of science, which question the validity of qualitative results. Last week, while participating in the LOICZ symposium (Land-Ocean Interactions in the Coastal Zone) in Rio de Janeiro, Brazil, I was very encouraged by the apparent move towards an integrated approach between the natural and social sciences. There were many important scientists from all over the world and from many different disciplines discussing the Earth systems and contributing steps towards sustainability of the world’s coastal zone. Many of the students’ presentations, including mine, had some social research component. I had many positive conversations about the Cyberlab work in progress and how it sits at the edge of building capacity for scientists/researchers, educators, exhibit designers, civil society, etc. However, even in this meeting, over dinner conversation, I stumbled into the conflicting views that are a part of the quantitative vs. qualitative debate — the understanding of scientific process as “only hypothesis driven”, where numbers and numbers alone offer the absolute “truth”. It is still a challenge for me not to become extremely frustrated while having to articulate the importance of social science in this case and swim against a current of uneducated opinions about the nature of what we do and disregard for what it ultimately accomplishes. I think it is more than proven in today’s world that understanding the biogeophysics of the Earth’s systems is essential, but that alone won’t solve the problems underlying the interaction of the natural and social worlds. We cannot move towards a “sustainable future” without the work of social scientists, and I wish there would be more of a consensus about its place and importance within the natural science community. H0 “Moving towards a sustainable future is not possible without the integration of natural and social sciences”. Although, empirical research can NEVER prove beyond the shadow of a doubt that a comparison is true (95 and 99% probability only), I think you would agree that, if these hypotheses could be tested, we would fail to reject the null. With all that being said, I emphasize here today the work Cyberlab is doing and what it will accomplish in the future, sitting at the frontiers of marine science and science education. Exhibits such as the wave laboratory, the climate change exhibit on the works, the research already completed in the lab, the many projects and partnerships, etc. , are prime examples of that. Cyberlab is contributing to a collaborative effort to the understanding and dissemination of marine and coastal issues, and building capacity to create effective steps towards sustainable land-ocean interactions. I am very happy to be a part of it! Posted in Conferences, Events, Partnerships, People, Qualitative Data, Research, Science Communication, scientists, Theory and Frameworks.